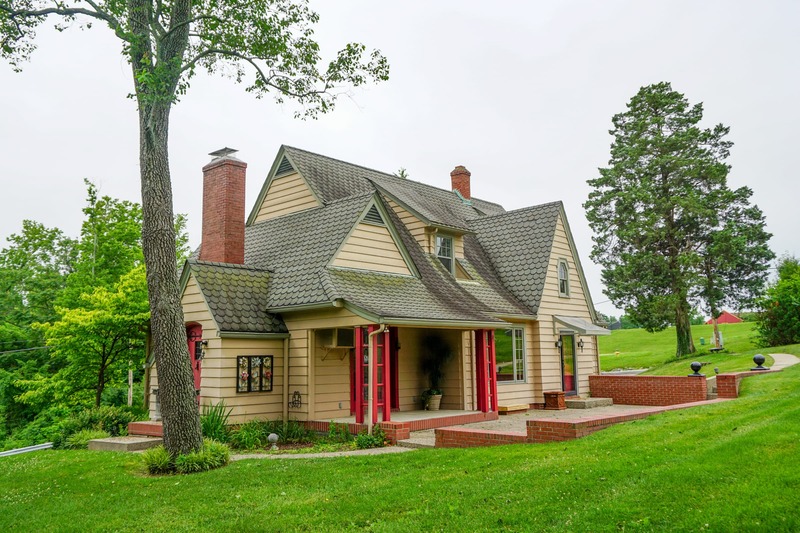 Silver Hills Cottage View Auction — Harritt Group, Inc. Spacious 4-bedroom cottage in historic Silver Hills just minutes away from revitalized downtown New Albany and across from the newly completed Nature Trail. Home features stunning lines with an unbelievable four-season view of the Sherman Minton bridge and Louisville, KY. In the hills above the city a 1 1/2 story cottage built circa 1929 with 1966 square feet features a truly enviable view, covered concrete porch that leads into a charming courtyard, unfinished basement with one-car garage on a .7 acre lot with 6+ acres across street that leads over to Falling Run Creek and the Historic Silver Hills Nature Trail. Located just ½ mile from I-64 and 6 miles from downtown Louisville. This 1966 square foot 1 1/2 story 4 bedroom – 3 bath home features original woodwork throughout, archways, spacious living room with fireplace and 2 picture windows with a city view, formal dining room, eat in kitchen, 2 bedrooms, and full bath on the first floor. Second floor includes 2 bedrooms, full bath and attic storage. Extras include dimensional roof shingles, hardwood floors throughout much of the home, a kitchen nook perfect for a bistro table and fireplaces on the first floor and basement. This home has been in the same family since the 1920’s, do not miss this once in a lifetime buying opportunity. The Endris Family has given the Silver Hills Historical Society a 30 year lease through 2045 for a walking trail on the 6+ acre tract which is located across the street in the newly completed nature trail and wildlife sanctuary. 10% down day of auction, balance due in 40 days. Possession at closing. Buyer to assume Spring 2017 Tax Installment due Spring 2018. Selling as-is with no contingencies, all inspections welcomed prior to auction. West Spring Street to top of Spring Street Hill.